Click on all images for larger view. I am deeply grateful for the support I received from many people in Laos who made it possible for me to uncover many of the ancient sites in and around Champassak, S Laos. I particularly want to thank Thongsa Sayavongkhamdy, Director General Department of Museums and Archaeology with the Ministry of Information and Culture in Vientiane for his guidance and introductions to the officials at the Vat Phu Temple, as well as the surrounding ancient city of Kuruksetra. My thanks go to Mr. Thongkhoune Boriboune, Director of Vat Phu Monument, Oudomsy Keosaksith, Deputy Director of the Vat Phu Museum, and Tha Sirychantho, Chief Administrator for Vat Phu. Little is known by todays's Indologists of the influence of the ancient city of Kuruksetra in India upon another ancient city with the same name, which is located in Champassak, S Laos. Kuruksetra in India is one of that countries most holy places where pilgrimages to the sacred sites of Braham Sarovar and Jyotisar take place daily. 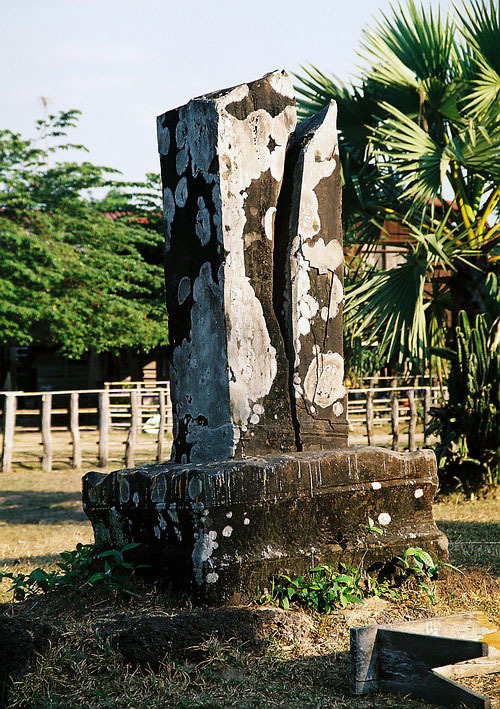 But Kuruksetra in Laos was lost in history until the discovery of a stele in the late 19th century with Sanskrit inscriptions mentioning Kurusetra as a Holy Land. The Indianization of Southeast Asia, in the Mekong Delta region of Cambodia, the central coast of Vietnam, and the southern mountain region in S Laos is the focus of this paper. This is a personal account of a pilgrimage (tirtha-yatra) to the 5th century Khmer temple, Vat Phu, in Champassak, S Laos, which is also the location of the ancient city named Kuruksetra. As a result of my previous pilgrimages to Cambodia visiting Angkor Wat, Beng Mealea, and Preah Vihear I learned that Vat Phu was connected to these temples by a complex road system. In fact, there are still visible signs of a royal road leading from Nandin Hall at Vat Phu directly to Angkor Wat; a distance of over 250 miles due south. 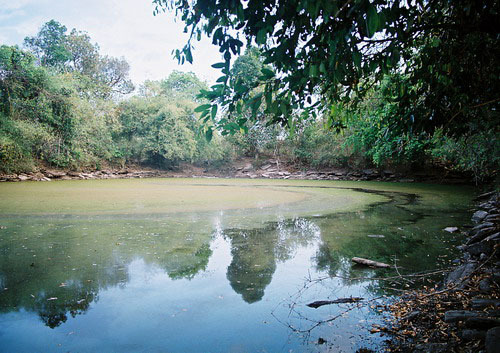 Beng Mealea, the 2nd largest temple in Cambodia, is located east of Angkor Wat. There is little if any knowledge about Beng Mealea's real function but there is a road leading north to Vat Phu just south of the temple. King Yasovarman I, took the corner stone for the construction of Preah Vihear from Vat Phu indicating the sanctity attributed to the ancient city of Kuruksetra. These few observations about Vat Phu, as well as seeing Vat Phu mentioned in the literature as a pilgrimage site by most all the Khmer kings over a thousand year period, prompted me to finally visit this sacred temple in Laos. In India, Kuruksetra is the name of a district in the present day Indian State of Haryana, and it is common knowledge held by the people of India, as to why Kuruksetra is considered such a holy a place. But more than likely the name Kuruksetra has never been associated with a holy place existing in Laos. Subsequently, my pilgrimage to Laos to see Vat Phu also led me to uncovering it being the cradle of the Khmer civilization and a direct link to the celestial cosmologies taught by Brahmin priests to the early Kings that reigned over the ancient cities of Kuruksetra, Shrestrapura and Lingapura. 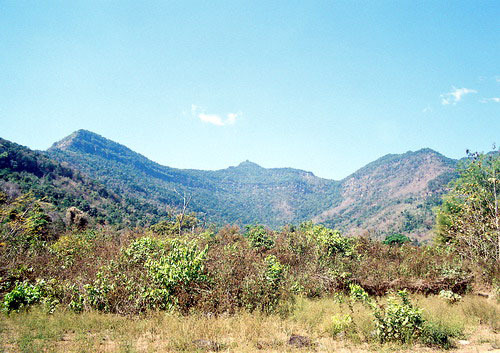 The entire landscape around Vat Phu including the sacred mountain of Lingaparvata (linga mountain), the sacred springs flowing from that mountain, and the east bank of the Mekong River were all designed and engineered to create a virtual"heaven on earth" in conformity with Hindu cosmology. The ancient city, located in Champassak, reflects the Hindu view of the world which prevailed from the 5th to the 12th centuries AD. 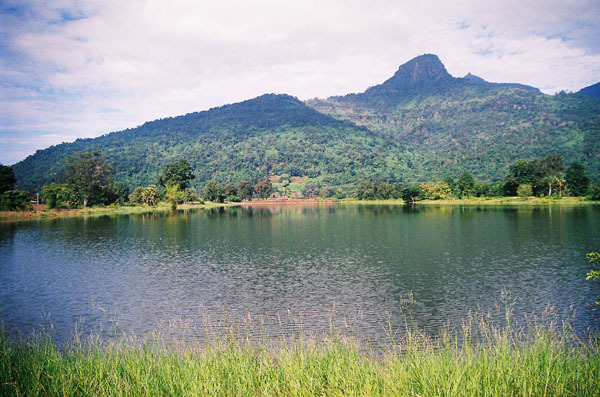 The location was strongly influenced by the peak of Phou Kao Mountain, named Lingaparvata and a symbol of Mt. Kailasa in Tibet. The Mekong River flowing past Kuruksetra represented the Ganges River in India as well as the Milky Way Galaxy and the Universal Ocean, upon which Vishnu reposed for thousands of years before beginning a new cycle of creation. The archaeological remains of the ancient city of Kuruksetra are the most in tact of any ancient site in Southeast Asia. The ancient city is only 6.5 km east of Vat Phu covering an area of 2.4 km by 1.8 km and surrounded by a 14m wide and 6m high double earth rampart including many small barays located in the village of Nong Viene village that were used for spiritual as well as utilitarian purposes. 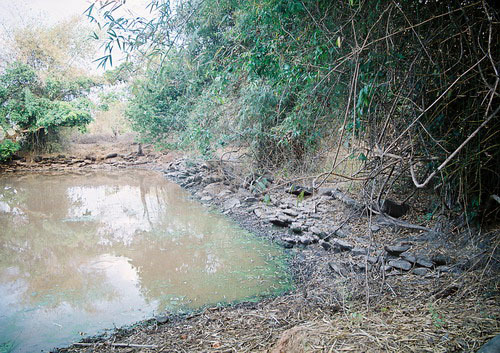 The names of these two barays are Nongsaphang Noy (small baray) and Nongsaphang Nhay (long baray) and the sandstones that once formed the retainer walls around the perimeters of both barays are in serious disarray as evident in the photograph. 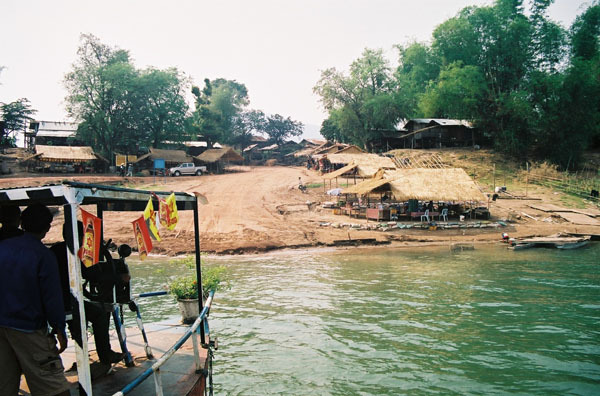 Going to Vat Phu in Champassak can not be accomplished by traveling on a super highway, or by rail or by air transportation, but by a very old ferry which crosses the Mekong River. The ferry carries local people and those who have a car or motor bike to travel on the dirt roads when they visit this most serene majestic temple complex in the ancient Holy Land of Kuruksetra. Before we start our pilgrimage I'd like to present a short historical context for both these ancient cities named Kuruksetra. As a place, Kuruksetra in India is where the epic battle Mahabharata was fought between the Pandavas and Kauravas in 3102BCE leading to the Hindu epic Mahabharata. This epic is an account of the life and deeds of a ruling dynasty named the "Kuru" clan. Kuruksetra literally means "Land of the Kurus". In this battle Lord Krishna (a manifestation of Vishnu) spoke to Arjuna, a Pandava, the blessed gospel of the Bhagavad Gita (the song of God), and the eternal message of spiritual wisdom. Kuruksetra is also the place where it is said that Brahma created the universe, and where the book of Manu was written which contains all the knowledge pertaining to the creation of the universe. The Bharata war is also the time, which begins the cycle of the Kali Yuga, man's descent into gross materialism, before entering the golden age of the Satya Yuga. In brief, these events have given Kuruksetra a place in history unlike any other. From Kuruksetra came the teachings that are used to this day by which to understand the spiritual teachings governing humankind and the laws forming the creation of the universe. For these reasons and more pilgrims go to the holy temples and water tanks daily to honor the gods of that historical moment of the Kuruksetra war leading eventually to the epic Mahabharata which immortalized the event for all time. Over the next 3,500 years the lessons that came forth as a result of the Kuruksetra war enabled Hinduism, with its attendant gods of Brahma, Vishnu and Shiva, to guide men's souls into samsara (the cycles of rebirth). Finally, in the 4th century BCE the poet Vyasa wrote the Puranas, which also included the composition of the Mahabharata. Of the three gods Shiva became the most revered, and over the millennia temples devoted to Shiva appeared everywhere in Southeast Asia. In particular, from the 2nd to the 16th century Shiva was worshiped in the land of Champa located on the central coast of Vietnam. It was here, at My Son, a Brahmanic culture flourished much like that in India. Then a the 4th century AD stele was found at My Son stating that King Bhadresvara built a temple in honor of Bhadresvara (combing his name with Shivas). The linga was used extensively by the Chams in both their art and architecture to symbolizing Shiva. It is also recorded that in 446AD China invaded Champa and destroyed many of its holy shrines and removed the sacred lingas from the temples. From these dim shadows of history speculation is more our guide in understanding the unfolding of events of that period in history than any remaining written records. Then in the late 19th century a French epigraphist, Georges Codes, translated a stele found at Vat Luong Kau on the western banks of the Mekong River in Champassk Laos. It was this stele that we learn that a King Devanika in 456AD consecrated a new Holy Land called New Kuruksetra. It is remarkable that finding this stele took place 4800 years after the Kuruksetra war in 3102BCE in India. This is testimony to the fact that the epic story of the Mahabharata was remembered and held in high esteem by Brahmin priests for thousands of years. The significance that can be attributed to the Mahabharata can never be overstated. Every event that is mentioned in this great epic incorporates astronomical references so that it is possible to correlate astronomical events in pre-history and verify those events with verses in the Mahabharata. What King Devanika brought to New Kuruksetra from his holy center in Champa was the blue print that would launch the greatest empire the world has ever known: the Khmer Empire. And why would King Devanika name his new land New Kuruksetra? My pilgrimage to Vat Phu slowly unveiled those secrets and this is where my story begins. At this point in my story I am indebted to Chhom Kunthea who is a Khmer scholar from the Royal University of Phnom Penh, Cambodia. Kunthea's recent research on the 64 lines of Sanskrit inscriptions on the Devanika stele bring to life more fully the scope and detail of the significance of the holy land of New Kuruksetra. Kunthea compares New Kuruksetra at Vat Phu with the original Kuruksetra in India and focuses on the meaning and background of the Mahatirtha. With the additional research done by Claude Jacques, an epigraphist from France, Kunthea has been able to show that the knowledge and understanding of the Mahabharata was fully understood by King Devanika and his court. Kunthea clearly shows that the influence of the arrival of Indian cosmology to Kambuja was much earlier than is generally accepted by Indo-Cambodian historians. Certainly it is safe to say that the epic story of the Mahabharata was very well known hundreds of years prior to King Devanikas consecrating his New Kuruksetra at the base of Lingaparvata when he erected his stele. We might even infer that the rishi Vakrashiva was the Indian poet guru who helped the new king to establish his Mahatirtha where he did. 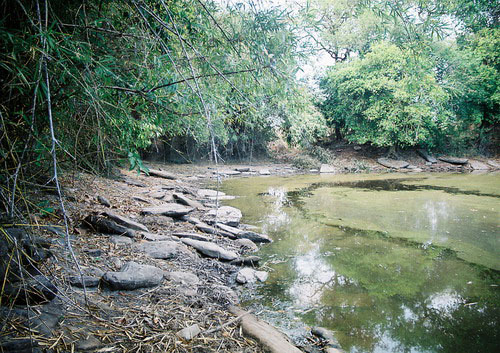 Vakrashiva was known to have lived in the area as a result of Sanskrit inscriptions being found in a cave stating his home was named Vakragupta. Vat Phu was the first Khmer temple that shows a direct influence of the Mahabharata on the establishment of the holy foundation that would influence all the future Kings of the empire. According to Kunthea the next time Kuruksetra is mentioned in a temple is 7 centuries later when King Suyavarman II created the southwest bas relief at Angkor Wat. Suyavarman's temple additions at Vat Phu and the construction of Angkor Wat, depicting the Kuruksetra war, is testimony to the lasting influence Kuruksetra had on the Khmer Kings. Kunthea's research further shows how many of the inscriptions on King Devanika's stele were taken directly from verses in the Mahabharata. 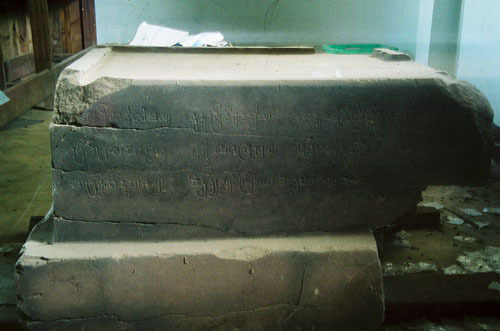 The importance on focusing on these lines of Devanika's stele was to reveal the spiritual significance tirthas had in India which in turn lent understanding to the holy tirtha (water tank) dug by Devanika at Vat Phu and which can still be seen today. The tirtha of King Devanika, remarks Kunthea, was as important as the tirtha in Kuruksetra in India. By bathing or dipping in the waters of this tirtha all sins would be washed away. Everyone would go to this watery tank and pray to the gods. Pilgrims only had to recite the mantra then one would become free from all suffering. When King Devanika saw this land over 1,500 years ago he too had to have been struck by the natural symmetry that lay stretched out before him. From the top of Lingaparvata to the river of stars which flowed directly behind him he had to have thought he was in a magical kingdom. For over 1500 years this land acted as a spiritual focal point where Lord Shiva lived with his wife Parvati. Two ancient trees form a natural gate into the palace grounds at Vat Phu On the north and south sides of the causeway leading into the temple grounds stand two palaces majestic and stately as if still occupied by kings studying their sacred scriptures. These palace additions and others around Kuruksetra were built by a long line of Kings who started coming to Vat Phu to receive what can only be considered the most holy instructions to honor Shiva, pay tribute to his celestial abode on Lingaparvata, and receive guidance in governing their Empire. How fitting then that Devanika's name is translated to mean (celestial protection). To demonstrate how these epic poems in the Mahabharata and Ramayana were honored at Vat Phu one need only visit the UNESCO Project holdings of found sculptures which came from the Vat Phu complex. Through the assistance of Tha Sirychantho, chief administrator for Vat Phu, I was able to see this most amazing collection of lingams, ante-fixes, an un-deciphered stele, and a pedestal for Nandin the bull, also found at Vat Luong Kau, which has Sanskrit inscriptions mentioning King Mahendravarmen.. The inscription has been deciphered by Claude Jacques in an unpublished paper titled: "Mahendravarman's Campaigns in North-East Thailand". This is a further indication of Kuruksetra's influence on the Khmer Empire. But, by far the most exquisite piece stone sculpture at the UNESCO Project holding room is the one showing Hanuman, the Monkey God King, saving Sita from the evil King Ravana. This un-displayed piece of Khmer art shows the beauty of Sita with her long flowing dress as she is whisked away in flight from the evil king. The story of Shiva and Sita is one of the most emotionally moving stories in the Ramayana and the sculpted image was placed somewhere in the Vat Phu temple complexhonoring the rescue of Sita. 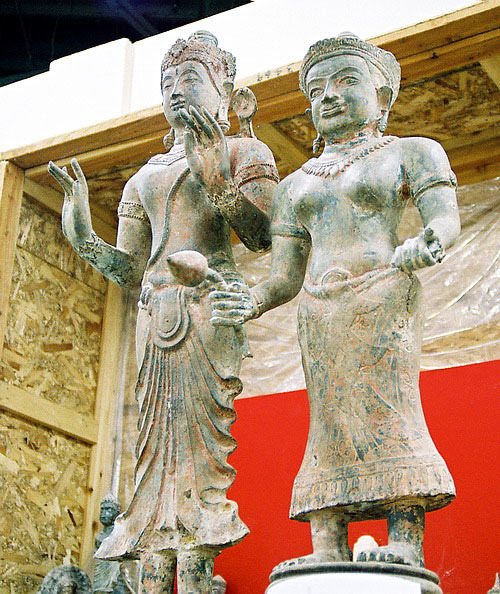 The magical kingdom that matured over the centuries at Kuruksetra in Laos can now be seen at the Vat Phu Museum. Here on the exhibition floor are the lions that once guarded the sacred sanctuaries, naga ante-fixes that once adorned palace corner roof tops, Nandin the Bull, holy lingas that were placed throughout the temple complex and even the linga which once was on the top of Lingaparvata. I was told it took 24 men a full day to carry the linga down from the mountaintop before it was placed in the museum. Oudomsy Keosaksith, the museum's Deputy Director, is currently inventorying all the museum's holdings before they are put on display. Fortunately I was given the rare opportunity to see this most stunning collection of stone sculptures depicting major episodes in the epic Mahabharata. The jewel of the collection is Lord Vishnu sleeping on the Universal Ocean. I could not help but admire and behold the greatness of this Lord who with a single breath could create countless heavenly kingdoms. And at the other end of the museum's holding room you could see Vishnu riding his mount Garuda. In this piece Vishnu can be seen with the discus (cakra) in his upper right hand and the lotus in his lower right hand. The iron club (kaumodaki) is in his lower left hand and the conch shell in his upper left hand. 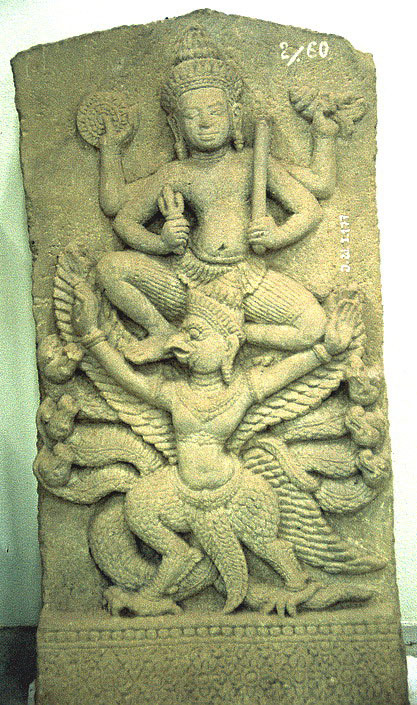 Garuda is subduing a multi-headed naga from the universal waters with his left foot. Turning around and looking upward there stood Shiva and Parvati and before them a sea of sculptures and lingams taken from the temples in and around the Vat Phu complex. 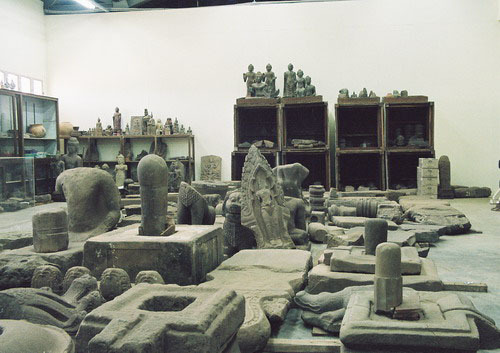 All the sculptures in the holding room represented every aspect of Hindu cosmology. It was astonishing to see such beauty all in one place, but at the same time tragic to know that these gods and goddesses no longer adorn the temples as they once did so many centuries ago. The present day antiquities market has created an unabated situation where collectors are pillaging ancient artifacts for private collections. For this reason it is necessary to protect these sculptures so others can read the story carved in stone that existed at Vat Phu. The effort to preserve Vat Phu is admirable considering the small budget the directors are working with. The temples remoteness along with the museum being severely under funded is hampering the restoration process. The entire ancient city complex is being left to the mercy of the natural elements and human interference. One perfect example of natural erosion is the stele located 30km south of Vat Phu at Ban That. The village of Ban That is extremely remote and only accessible by dirt roads. Ban That is in the Sukhumma district of Champasak province, and it is where King Suyavarman II erected three stupas (That Sampang) and a stele in honor of King Dharanindravarman I. The stele has considerable inscriptions on it, but slowly they are peeling off the stone surface and this period of history will be lost forever unless an urgent effort is made to save these inscriptions. 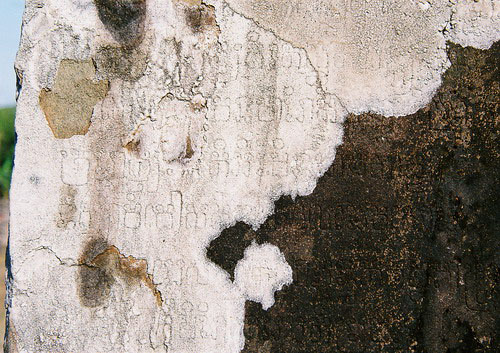 This is only one of many examples of deterioration, which plague Vat Phu. I strongly suggest philanthropic donors come to the rescue to help restore the temples at Vat Phu before it is to late. Kuruksetra would attract spiritual pilgrimages by Khmer Kings for the next 1000 years. This was the beginning, the birth place, and the cradle of the greatest civilization on Earth; it would be known as the Khmer Empire. Over 400 years would pass before King Jayavarman II would inaugurate this wondrous empire on top on Mt. 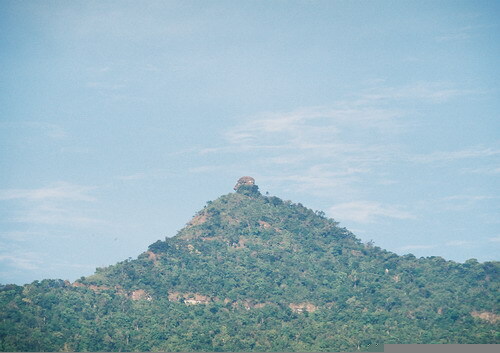 Mahendraparvata (Mt.Kulen) in 802AD. In the meantime, however, Kuruksetra, had become a magical kingdom. King Kammatha, builder of temples, set upon the top of the mountain a golden linga which gleaned in the morning sunlight. The spring water which came forth from the base of the mountain was channeled into a sacred shrine and would be the holy water for all oblations to Shiva. King Devanika's kingdom flourished and word spread quickly of the holiest city in all the land. Following King Devanika a new Chenla capital city was named after the first King of the newly formed Khmer empire. 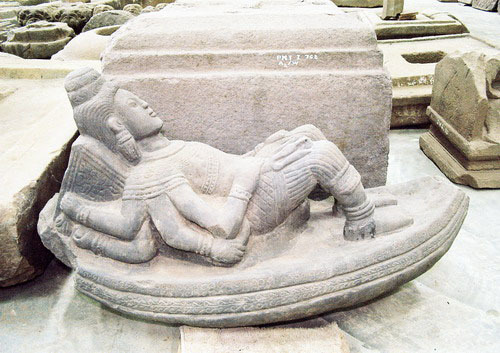 King Shrestavarman was the son of Srutavarman who was in turn the 1st King of Kanbuja (Cambodia) and a direct descendant of the lunar race or soma line from India. 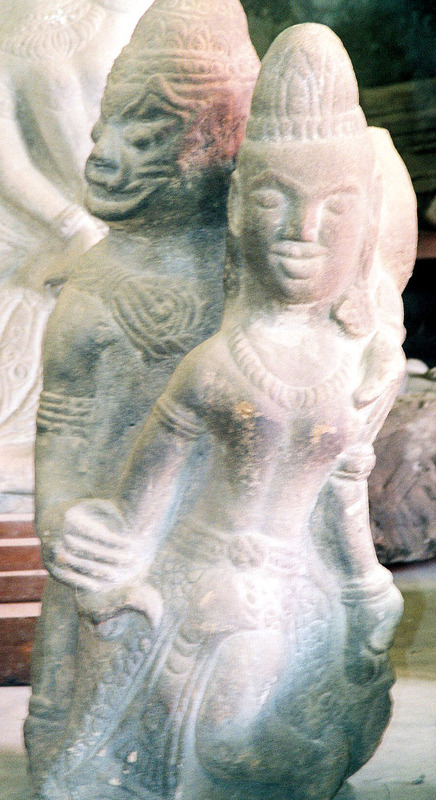 Srutavarman claims to have been a direct descendant of the 2nd Kundinya lineage which formed the genealogy for the succeeding dynasties of the Khmer empire. The new capital was named Shresthapura. The birth of the Khmer empire began in the middle of the 5th century in Kuruksetra, or what is today known as Champassak, in honor of the Cham King Devanika. The temple of Vat Phu would house the sacred linga of Shiva under the vocable of Bhadresvara, patron saint of the Chams, and act as the spiritual focal point for a long line of Khmer Kings who would develop the Khmer empire all the way through to the 14th century. The implications of the significance for this lasting duration of Vat Phu as a spiritual center can not be underestimated for its influence and meaning when applied to the Khmer civilization. Vat Phu was in all respects a temple modeling the universe and the beliefs which were held secret by the future purohitas and hotars had a lot to do with the way the civilization evolved. Shiva had shown to the world that he was in fact the most respected of all the manifestations of Vishnu. Mt. Kailasa is a very sacred mountain in the Himalayas and mythologically considered to be the sacred abode of Shiva and his wife Parvati. Mt. Phu Kao (chignon mountain) is another very sacred mountain and is located in S Laos in Champassak, and even though it is not in the Himalayas it is also considered to be the holy abode of Lord Shiva and known today as Lingaparvata. (linga of the mountain). The cradle of all human civilization is considered by many to be the Indus Valley and a very long time ago, as much as 12,000 years ago, humankind inherited a very unique and divine understanding of how it came to pass that knowledge of the universe was encoded into rituals, language and stone temples mirroring the secrets of the stars. This knowledge of time and space was attributed to divine beings, gods, who created the manifest universe as we know it today. The ancient cuneiform tablets of Mesopotamia alluded to knowledge of the heavens and ancient Vedic texts likewise tell the story of creation. These stories of long ago are referred to as the creation myths. However, to only read these ancient translations as myth misses the fact that they were real stories about real events taking place in the real universe. The pilgrimage to Vat Phu afforded me the opportunity to learn about the architects of the universe known a Brahma, Vishnu and Shiva. In order that their story of creation would never be forgotten the demigods of an age long forgotten fashioned the material world to mirror their knowledge of the universe. The teachings were passed down from millennium to millennium until today those stories have been preserved by countless carvings left on stone temples all over the world honoring the origin of the gods, by encoding those stories in pictograms, hieroglyphs, and ancient texts with symbolic references to the heavens. The Kings who came upon Lingaparvata in S Laos surely must of thought they were being communicated to by the heavenly hosts of creation as they witnessed that high atop the mountain, fashioned by nature's creative forces, appeared a natural linga. Here was a symbol of Lord Shiva, and below his heavenly abode ran a cosmic river reflecting the stars of the Milky Way galaxy. The entire land was filled with the auspiciousness of Shiva. From the top of the mountain Shiva was holding the mighty Ganges River in his hair, and slowly he allowed it to trickle to earth so prosperity and well being could be enjoyed by all living things. Surely no other place could be more holy than Lingaparvata in S Laos except for Mt. Kailasa in the Himalayas or Mount Meru in mythical Shambhala. While I stood still on the edge of an old motorized raft laden with food and animals to be taken to local markets I saw the western banks of the Mekong River slowly come into focus. As I approached the land I could see thatched houses lining the streets and high in the sky was the silhouette of Lingaparvata peaking through the morning haze. I knew at that moment I was about to relive one of the most important periods in SE Asian history as King Devanika had done over 1,500 years ago by establishing a holy land that would eventually become the birth place of the Khmer Empire. The holy land of Kuruksetra was about to be entered. Once I set foot on the land of this ancient city I could not help notice how quiet every thing was. The cattle were grazing on the open roads and the mood was extremely peaceful. It felt as though time had intentionally forgotten the small town of Champassak, and a distinctive air of a long gone center of religious activity could still be felt. The evening approached and with it a warm dark velvet sky punctuated with a million sparkling stars. I had made it to the Holy Land of Kuruksetra. As I adjusted to my surroundings I prepared myself for an early evening sleep as I knew I would need plenty of rest for the journey up the mountain to see the ancient temple of Vat Phu. Lingaparvata was the center of the spiritual force at Kuruksetra and from the four cardinal directions temples were constructed as if Kuruksetra were a cosmic mandala. Vat Phu is one of the best examples of an axial or liner layout, which combines all the features of the landscape between the mountains, and the river, which formed Kuruksetra, the Holy Land. If you draw a line from the top of Lingaparvata through Vat Phu, cross the Mekong River, you will eventually come to Tomo Temple where Shiva's consort Rudrani was honored. The Tomo temple complex is oriented on a northwest-southeast axis, which is aligned with the top of Lingaparvata. An inscription found in the late 18th century by Etienne Aymonier was related to King Yasovarman I (889AD) mentioning the foundation of a monastery dedicated to Rudrani the name of Shiva's consort when he takes the form of Rudra (The Howler). 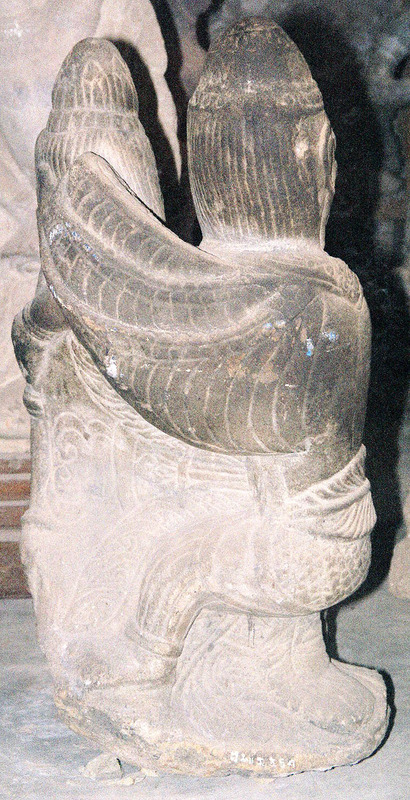 This is another example of how King Yasovarman used axial alignment for devotional purposes. This inscription is now housed in the Albert Sarraut Museum in Hanoi. Directly above the southern palace is Nandi hall. If you draw a line south from Nandi Hall it will pass through Hong Nang Sida Temple, Thao Tao Temple and further south to the three stupas at That Sampang in Ban That and the large Ban That baray. From the central sanctuary you can draw a line north to Vat Oubmong and from Vat Oubmong you can draw a line directly west to the top of Lingaparvata. The entrance to Vat Oubmong faces east as does the central shrine at Vat Phu. The placement of the two barays in front of the main palaces coincides with the summer solstice and vernal equinox. There are many other measurements employed in the architecture at Vat Phu which strongly suggest that the Brahmin priests were very familiar with the significance of astronomical events in the heavens. These priest architects were able to incorporate those heavenly events into their ground plan at Kuruksetra much like was done at Angkor Wat. So, with the above short history establishing Kuruksetra as a Holy City in Laos I will conclude with an interpretation of a few of the carvings in the temples which were constructed between the 9th to 12th century AD, which I believe supports a celestial framework and the development of the Devaraja cult. There is much controversy concerning placing any meaningful relationship between specific measurements used in temple construction with astronomical events. There seems to be two distinct camps on this issue. One camp favors a strict classical approach which excludes celestial overtones, and the second camp comprised of archaeo-astronomers have been able to see how astronomy played a direct role in temple architecture. I have already mentioned how the landscape at Vat Phu mirrors Hindu cosmology, but it is also possible to find an indication of the importance astronomical measurements had in the spiritual development of the Kings at Vat Phu beginning with Kuruksetra. I believe these astronomical associations eventually led to the Devaraja cult (Divine Rule) whereby a King would become the Lord of the World (Cakravatin). The Devaraja cult is little understood in as much as there are no records describing the rites and rituals which surrounded this cult. First, let's look at the astronomical influences at Vat Phu. The ancient city of Kuruksetra is oriented on the cardinal points of the compass. This, N, S, E and West orientation is the basis for understanding how the Brahmins brought the design of the universe down to earth to mirror the Hindu cosmology. This paper is far too short to delve into all the details to support a lengthy analysis of astronomy and its association with the Devaraja cult, therefore, I will only mention a few examples of each of these topics, among many, which led me to the conclusion that Kuruksetra was a city modeled after the universe, and that all subsequent kings contributed to this fundamental knowledge of Hindu cosmology. King Suyavarman II, builder of Angkor Wat, understood very well how to combine these cosmological measurements with architecture as is evident by how he incorporated them into Angkor Wat. Eleanor Mannikker in her book, "Angkor Wat: Time, Space, and Kingship", demonstrates the complete layout and physical dimensions of Angkor Wat to calendrical calculations verifying the Khmer's use of the Hindu cosmological system. Mannikker's thesis is very controversial because of her making such strong associations between astronomy and architecture at Angkor Wat. Classical Indologists can not relate to her work, but her position in no way hinders her contribution to the understanding of how astronomy and architecture are integrated into temple construction. Even before King Suyavarman II there were kings who were knowledgeable about using these associations of divine knowledge and astronomy. King Yasovarman I used the axial alignment when he began construction of Preah Vihear and again King Suyavarman II used the axial temple at Phnom Rung, which is situated in northeast Thailand. But it was Jayavarman II who integrated both Hindu cosmology and astronomy to become the first God-King in 802AD when he consecrated the Khmer Empire. In 1973 Pierre Lintengra found a Sanskrit inscription relating to the importance of the founding of the Khmer Empire by Jayavarman II at Vat Oubmong on the eastern slopes of Lingaparvata. As I have already mentioned Vat Oubmong is aligned perfectly with the top of Lingaparvata while the entrance faces due east. We have to keep in mind the cardinality of Kuruksetra as I make these observations between astronomy and architecture. In ancient times the earth was thought of as flat or a great plain with its four corners being the two equinoxes and two solstices. These four corners were identified as the intersecting points on the plane of the ecliptic with the celestial equator. King Suyavarman II placed the two barays in front of the two palaces at Vat Phu where the northern baray reflected the sun during the summer solstice and the baray aligned with the axial pathway to the main sanctuary reflected the sun during the vernal equinox. These are two intersecting points on the ecliptic with the celestial equator. This is an example of incorporating astronomy into temple construction. It is a very complex study to understand how these events in the heavens were used when composing the Vedic scriptures, yet these heavenly events were recorded, interpreted and used for divination through a very symbolic system of measurement employed in temple architecture in both India and SE. This topic alone deserves a separate paper. Scholars of today are just beginning to understand the spiritual significance these astronomical cycles had on ancient cultures and their cosmologies. It is a subject that was first brought to light in 1969 by the publication of "Hamlets Mill" by Georgio de Santillana and Hertha von Dechend. This singular book clearly demonstrated how astronomy was incorporated into all the world myths. To remind the kings of this most holy and divine knowledge of the heavens carvings depicting references to astronomical events enabling kings to attain immortality were placed throughout the Holy Land of Kuruksetra. And even though the name of the city would change with new kings ruling the land the original cardinal layout of the ancient city of Kuruksetra provided a template by which to continually develop the basis for the Devaraja cult. New Kuruksetra, the Holy City of King Devanika, was designed keeping that divine knowledge of access to the kingdom of the gods alive by using not only the cardinal directions on earth but heavenly references as well. So now I hope I have put New Kuruksetra in a new light. The restoration process has barely begun and the assimilation of all the sculptures, temple measurements, as well as the completion of translating the Sanskrit inscriptions will certainly bring more clarity to the function of the temples and the urbanization of Kuruksetra. The uncovering of artifacts from the ancient city is an on going process and history is constantly being rewritten as a result of all the archaeological discoveries. We know Kuruksetra was the cradle of the Khmer civilization, and we know through translations from other inscriptions in other temples the many kings who paid tribute with gifts to this Holy Land of Kuruksetra. Based on contributions made by King Suyavarman II to Vat Phu, it is safe to infer that there are astronomical measurements built into this axial temple which we are just beginning to uncover. With the many mentions of King Jayavarman II it's also safe to infer that the origins of the Devaraja cult was developed at Vat Phu using the natural landscape of the ancient city as a spiritual guide. New Kuruksetra established by King Devanika in 456AD may have been lost in history but today we know the ancient city of Kuruksetra still exists after all these centuries and slowly the full scope of the Holy Land will be revealed to the rest of the world. For now Vat Phu still stands beneath the towering Lingaparvata with the barays full of water lilies and throughout the Holy Land of Kurusetra the temples await their restoration but are still striking reminders of a once great thriving city that became the spiritual center for a thousand years. What New Kuruksetra lost in terms of its history has more than made up for it by still providing the pilgrim with a deep sense of the sacred. Kuruksetra in Laos has never lost its place in history just like its counter part in India has always been able to keep the history of the Mahabharata as the worlds most spiritual epic. I'll go to Kuruksetra I'll stay in Kuruksetra. Albanese, Marilia, "Angkor: Splendors of the Khmer Civilization", (2002), Asia Books, Bangkok. Buck, William, "Ranayana", (1976), Mentor Books, NY. Buck, William, "Mahabharata", (1973), Univ. California Press, USA. The Golden Age of Khmer Art", (2004), Latchford Pub. Choulean, Ang, "People and Earth", (Mar. 2000), Reyum Gallery, Phnom Penh. Coomaraswamy, Ananda K., "The Dance of Siva: Essays on Indian Art and Culture", (1985), Dover Pub. NY. De Santillana, Giorgio, Von Dechend, Hertha, "Hamlet's Mill", (1977), David P. Godine Pub. UK. Freeman, Michael, "A Guide to Khmer Temples in Thailand and Laos", (1996), River Books, Bangkok. Hancock, Graham, "Finger Prints of the Gods", (1995) Crown Trade Pub. NY. Hancock Graham, "Heavens Mirror", (1998), Crown Pub. NY. Jenkins, John Major, "Galactic Alignment", (2002), Bear and Company, Co. USA. Mann, A.T., "The Round Art", (2003), Vega Books, UK. (1996) Univ. of Hawaii Press . Aethyrea Books, North Carolina, USA.